Hello there, I'm from Malaysia. I started growing cactus in 1995, since then I already have around 50 different species and my collection is still expanding. Growing cacti in a tropical country is not easy. My country, Malaysia is located in the equatorial zone. Throughout the year, the average temperature is 26oC (80oF) and the annual rainfall is over 2400mm (95 inches) with a humidity of 80%. With such a high rainfall, the cacti must sheltered from excessive rain water and sunlight. What I do is to built a rack that is shape like a house. The roof is covered by a sheet of transparent plastic and a mesh netting that allows around 80% of sunlight to go through. The purpose of putting a mesh netting is to prevent the cacti from getting burned and also to protect the transparent plastic sheet from being torn by strong winds. 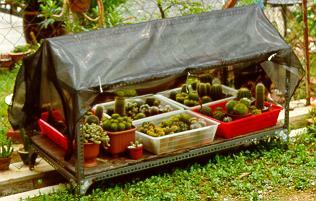 Do not cover the four walls of the rack as it is important to allow a free flow of air for the cacti. Place the rack under the sun. Do not place your cacti under the shade (as some people will suggest) as it is important for the cacti to get direct sunlight to ensure a good and healthy growth. Water your cacti once a week. Skip the watering if it rains too often or if you find that the soil is still wet. Use rain water if you can. If you are going to use tap water, leave it overnight before using it. Do not water the whole plant as salt deposits may damage the cactus's skin, you should only wet the soil. Add some liquid fertilizer (specially prepared for cacti) during the cacti growth period. Use soil that can drain easily (I usually buy it from the supplier). These tips are given to me by a guy that owns a cacti nursery in Cameron Highlands. He sells his cacti in Kuala Lumpur. The cacti he sold are all reasonably priced (cheaper than any where else that you can find). If you have any comments, suggestions or questions, please email me. Last updated: September 1, 1999. Copyright © 1997 - 1999 Ching Yen Choon all rights reserved.